After work I decided to do a little baking. I was in the mood for something sweet, dense and carb-y. After perusing in my cabinets I found this recipe from Vegetarian Times magazine. They came out pretty good. Moist but cake like in the middle and VERY filling. Well, at least I assume they are filling . . . I’m sure if I didn’t eat more dough then actual baked cookie I’d know for sure 😉 The one thing i would change about them is that there aren’t enough oats or chocolate chips throughout the finished product. I’ll be sure to load up for next time. 2. In food processor or mixing bowl, combine butter and peanut butter, and process, or beat together with wooden spoon, until well blended. Add sugars and process or stir until combined. Beat in eggs and add vanilla; blend well until smooth and creamy. 3. Combine flours, baking powder and salt. Add dry ingredients to wet and process, stopping to scrape down sides of bowl, or mix well with wooden spoon. Dough will be stiff. Stir in oats and chocolate chips. 4. Roll dough into balls about 11/2 inches in diameter and place about 2 inches apart on ungreased baking sheets. Flatten dough. 5. 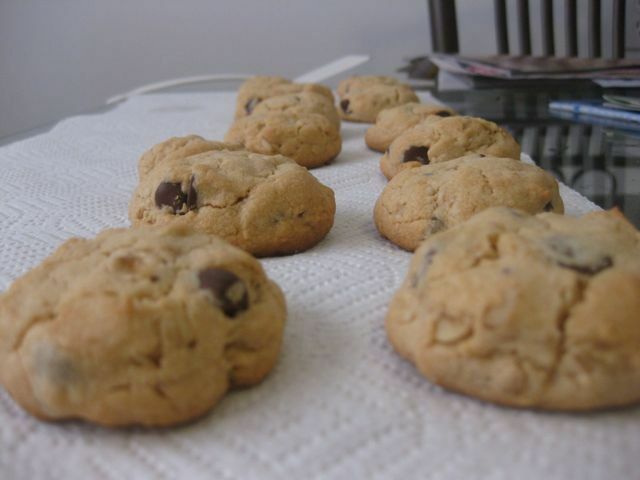 Bake cookies for 10 to 12 minutes, until golden brown. Cool on baking racks.